Listen to "Foreign Influence: A Thriller" on your iOS and Android device. 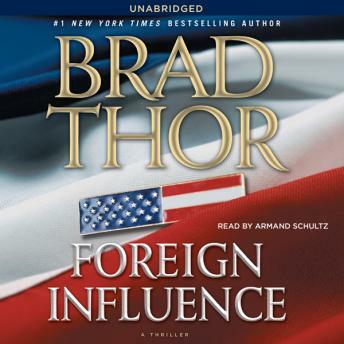 Navy SEAL turned covert Homeland Security operative Scot Harvath is called to action once again in the hottest political thriller yet from #1 New York Times bestselling author Brad Thor. Buried within the black ops budgets of the Department of Defense, a new spy agency has been created. Unfettered by the oversight of self-serving politicians, it reports only to a secret panel of military insiders. Its job is to target America’s enemies—both foreign and domestic—under a charter of three simple words: Find, Fix, and Finish. Recruited as a field operative, Scot Harvath has just returned from his first assignment abroad when a group of American college students is killed in a bombing in Rome. The evidence points to a dangerous colleague from Harvath’s past and a plan for further attacks on an unimaginable scale. Harvath is tasked with leveraging his relationship to lure the man out of hiding and kill him on the spot. But what if he has the wrong man? Simultaneously, a young woman is struck by a Yellow taxi in a hit-and-run on Chicago’s near west side. With only two intoxicated witnesses and more than 5,000 Yellow cabs in the city, the Chicago police have given up on their investigation. But when the family’s attorney plunges into the underground cab community, he will uncover a shocking connection to the bombing in Rome and the perpetrators’ plans for America. Exciting and fast moving. It was interesting to have female operatives . I was so intrigued by the dogs that I had to Google the breed. OMG. If you like black ops type stories, you will love this book. At last there is a book with female operatives. Brad Thor was a wonderful find.